Not as successful as in recent times, this year’s Cambridge Autumn Regatta saw us come away with a solitary win. Despite this, we had many good performances, with the scratch IM3 4+ so nearly taking a win as well and the Women’s Eight narrowly missing out too. With many of our more experienced rowers missing and (again) a number of crews rejected for no competition, this wasn’t actually a disappointing day. This was a scratch crew, comprising Pierre-Yves, Simon, David and John, racing for the first time together. 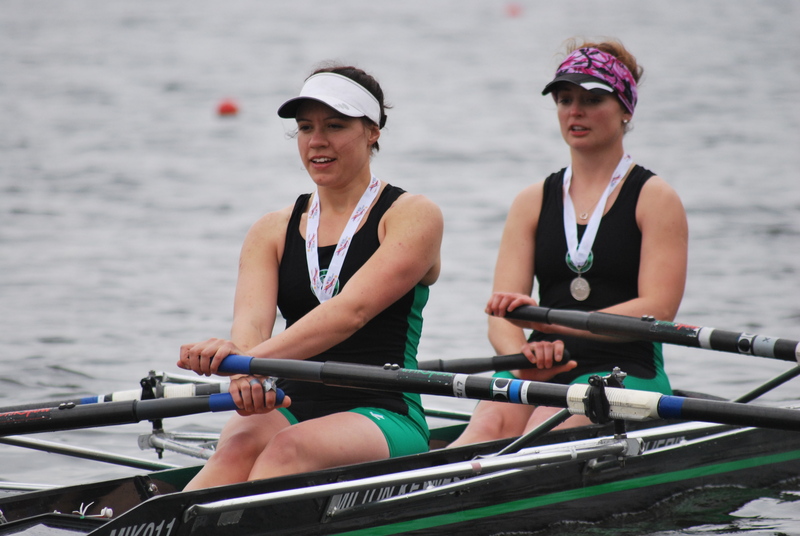 A fairly easy win in their first race (against Peterborough) put them into a semi, against a Boston/Lincoln composite. This was a much harder race with our boat being pushed all the way but they came out on top, winning by around a length. The final pitted them against Green Templeton College; despite a hard-fought row, it wasn’t to be their day and our guys finished just 3/4 length down. A really good performance, considering a scratch crew was racing a college boat! John hopped out of the IM3 four and into his single for a race against one of the Northampton giants. Despite giving away at least three feet in height (well, maybe not quite that much, but it seems it), John sculled really well, keeping Northampton under pressure all the way and trailing in by just over a length. 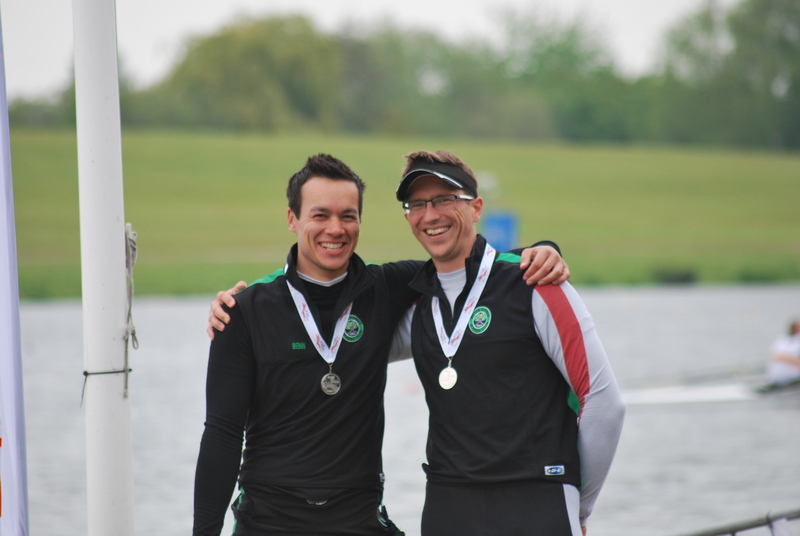 Swapping rowing for coxing, John made his inaugural appearance coxing the Master 4+. A hard learning curve for him as we undercut the corner and very nearly hit the bank. This disrupted our flow and although we had been keeping up with X-Press, this dropped us well behind. The frantic race to try and catch them led to the boat getting very scrappy and we finished well down. Not our best race. 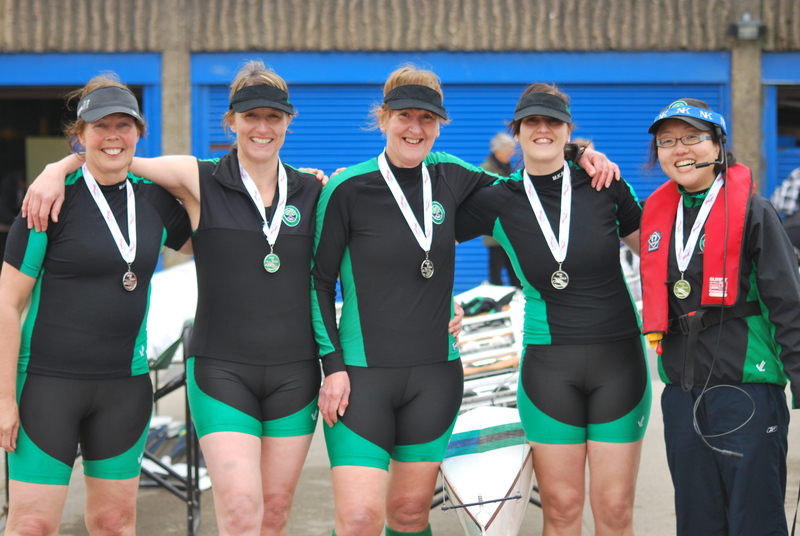 Thanks to Cambridge 99 for allowing us to enter a boat in this category, having had many of our ladies’ boats rejected. With a last minute change to swap Sue in for the missing Sam, this was a bit of an unknown. However, a storming start in the semi (against City of Cambridge) saw our ladies pull out a big lead and win the race comfortably. The final saw them against the second City of Cambridge boat. After a couple of missed strokes off the start, we were left chasing the City boat and although we were eating into their lead, they proved strong enough to hold off our ladies and we lost by 3/4 length. A good performance though from Lindy, Paula, Jo, Lou, Alice, Sue, Karen and Clare, excellently coxed by David. Had this been a BR event, we’d have won it – the winners were roundly ticked off for “persistent and obvious coaching” from someone riding along the far towpath. When someone is calling for pushes and shouting out how far to the end, it is a bit OTT! We originally had two boats entered in this category but one scratched on the day (a combination of not having blades and Sam not being there with neither Lindy nor Jo wanting to risk picking up a point) leaving Karen and Lou to row over in their first race. The final was against a very young crew from Peterborough, who flew off the start and pulled away quickly. As with many crews during the day, we then had a minor altercation with the far bank, leaving Peterborough to win with an “easily” verdict. Great to see Helen back racing again! She had a straight final against Champions of the Thames, with the added handicap of a three second delay (she’s “B”, her opponent “C”). This didn’t deter Helen and she stormed off the start and had caught up the handicap well before halfway and was pulling away when her opponent also hit the bank. This left Helen with our only win of the day but still a satisfying one as she caught and passed her oppo before she’d stopped. Although they finished well down against Broxbourne, it was a delight to see this boat out and racing. With Roger making his racing début at 70+ and Iain steering a race for the first time, we didn’t expect a win but they sculled very well and (unlike so many) avoided the bank. A really encouraging first race, hopefully many more to come. Wonderful to see a crew from our last “Learn to Row” course out and racing so soon. As this was pretty much a learning experience, with none of the four of Sue, Mary, Gaya and Winnie (coxed by Jo) having ever raced before, the main objective was to get through the race. Pitted against a strong Broxbourne boat, it was noticeable that our ladies were technically neater although well behind on the course. An unfortunate crab stopped the boat but they recovered and carried on to finish. First race over ladies, now to start going for it! I really like Cambridge Autumn. Whether it’s because it’s the last regatta of the year, it always seems more chilled than most and this was highlighted by the PA early in the day making it clear that flexibility was the main objective for the day – if you and your opponents are ready, then you can race whenever. A refreshing change from the “must run in order” attitude from some other events. The organisation is getting better each year (long gone are the stressful days of poor marshalling and communications) and the whole thing ran well to time despite the best efforts of some pleasure boats and barges. This friendly attitude was also shown when we realised after the first round of the women’s eight that we hadn’t notified the crew change. On reporting this to race control, they were very relaxed about it and just accepted these things happen and that “common sense should prevail”. Helped by swapping a “three-pointer” for a novice but such a refreshing attitude. Funniest things of the day – a coach of a crew that we’d beaten coming over to thank us, as his crew “needed taking down a peg or two”. We added to his amusement by telling him it was a scratch boat as well, something he was going to delight in relaying back to his crew! Second was the crazy coracle race at the end – imagine trying to row what is basically an oversized pudding bowl. As you take a stroke on one side the thing just swings round in the opposite direction; very funny to watch. Thanks finally to the clubs (sorry but I don’t know which ones) that lent us cox boxes for the eight. Definitely saved David a lot of shouting. You are currently browsing the archives for the regattas category.